This Elstead Sven 1 light outdoor wall or porch ceiling lantern in graphite finish is rated IP54. 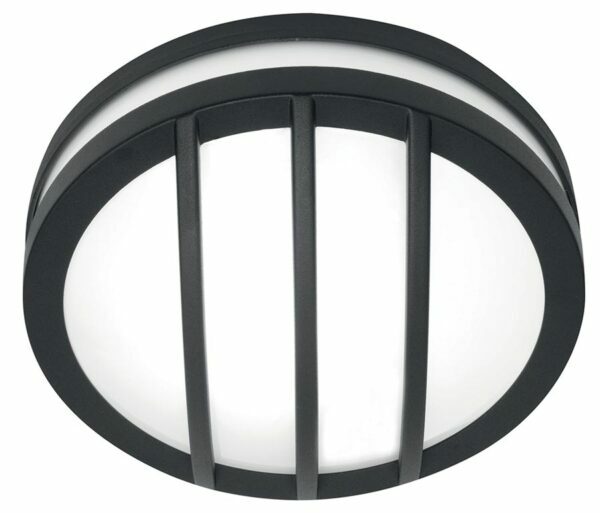 Small circular mount and fascia featuring three protective bars in graphite finish, with opal white polycarbonate shade sandwiched in-between. Can be used as a wall mounted bulkhead or flush mount porch ceiling lantern. This exterior light is supplied by Elstead Lighting, a British company that specialise in the manufacture and distribution of quality decorative lighting such as the Sven 1 light outdoor wall or porch ceiling lantern in graphite finish and rated IP54 you see here.